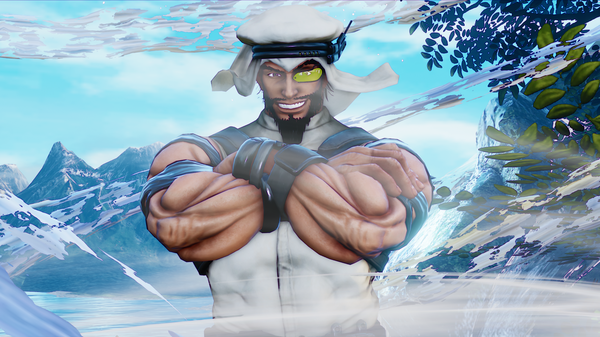 First unveiled at Games15 last week, Capcom has fully detailed Rashid, the newest character in Street Fighter V.
Using the power of wind, Middle Eastern fighter Shahid is “one of the more difficult characters to catch,” utilizing parkour inspired, fast-paced attacks. Having an affinity for technology, his fighting style is more casual. Rashid performs a high flying flip over the opponent. Pressing kick during the Front Flip results in Rashid performing a divekick. Rashid closes the gap between himself and the opponent with a quick front roll. Pressing kick during Rolling Assault results in Rashid kicking upward at the opponent. Rashid throws out a slow moving whirlwind that closes in on the opponent and causes damage to them if they touch it. While the whirlwind is out, Rashid can use it to increase his movement on any attack that propels him forward. When Street Fighter V launches for PlayStation 4 and PC in Spring 2016, it will include 16 fighters, with four of them being brand new.